Hitachi Automotive Systems Ltd. announced that it has developed One Fail-Operational technology, a fundamental technology that is essential for the realization of Level 3 autonomous driving. If one core component of an autonomous driving system such as the Electronic Control Unit (ECU) is damaged and becomes unable to function, this technology transfers some functions to other components, enabling the vehicle to temporarily continue to drive autonomously, and safely and smoothly transfer control of the driving back to the driver. Hitachi Automotive Systems aims to commercialize this technology by 2020. Currently, automotive manufacturers are developing Level 3 autonomous driving vehicles in which systems essentially perform all driving tasks, aiming for full-scale market entry by around 2020. As Level 3 systems near realization, one issue is how to safely and smoothly transfer control back to the driver in case a core component is damaged, and the autonomous driving system ceases to function. Hitachi Automotive Systems’ newly-developed technology consists of a system with redundant architecture. When a core component is damaged and ceases to function during autonomous driving, the technology uses methods such an emergency circuit to prevent partial functionality, and transfers some functions to other components related to autonomous driving, enabling the autonomous driving system to continue to function. This means that the vehicle can temporarily continue to drive autonomously, and safely and smoothly transfer control of the driving back to the driver, even if a core component is damaged and ceases to function. In the autonomous driving system constructed by Hitachi Automotive Systems, typically the external recognition sensors detect the situation around the vehicle and consolidate this information in the autonomous driving ECU, which executes the judgement function and selects the most suitable autonomous driving plan from multiple options, including the driving speed and trajectory. 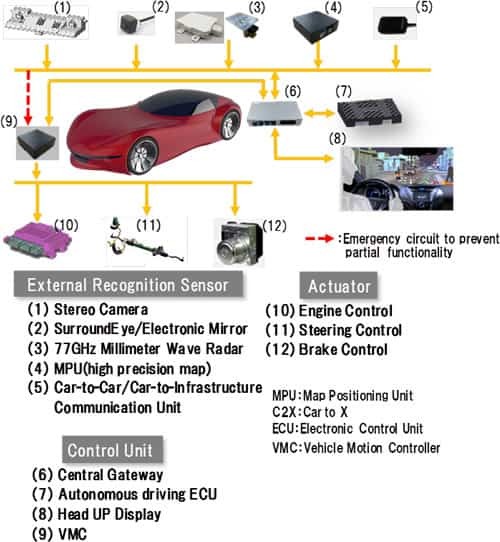 After the information is consolidated, the autonomous driving ECU drives the vehicle while sending the control signals necessary for actuator control of the vehicle to the Vehicle Motion Controller (VMC). As an example, with the newly-developed technology, in the event that the autonomous driving ECU ceases to function, the VMC will inherit some of the autonomous driving ECU’s vehicle control functions, and autonomous driving can continue for 10 more seconds while the system alerts the driver to take control of vehicle handling. Because the autonomous driving ECU sends a safe trajectory to the VMC so that both devices redundantly ensure the trajectory, the vehicle can gradually transition to reduced functionality. Immediately after a component ceases to function, the system alerts the driver to the emergency situation and temporarily continues to drive autonomously so that the driver can safely and smoothly transition to manual handling. Hitachi Automotive Systems will continue to strive to develop and provide products and solutions that will contribute to the commercialization of autonomous driving vehicles.